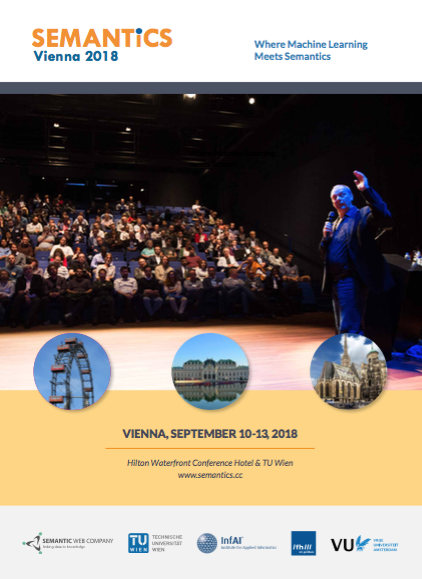 SEMANTiCS 2018 is a leading international conference on Smart Content, Linked Data, and Semantic (web) Technologies where business users, vendors and academia meet. It is the fourteenth edition of a well-attended annual conference that started back in 2005 and has since then become widely recognized as the premier venue where industry and academia gather to exchange ideas and advance the state of the art of data management and knowledge technologies. SEMANTiCS features keynotes by world-class practitioners, talks, presentations and eld reports on a wide range of topics, vivid panel discussions, and vivid panel discussions. Semantics provides ample opportunities for networking and meeting like-minded professionals in an informal setting. Get in touch with the SEMANTICS Sponsoring Team regarding requests, questions and booking.